You know that feeling you get when you just need a drink? It can happen after a day of business meetings, crunching numbers or meeting new people. Tel Aviv, the center of business and love in Israel, creates many opportunities for grabbing a drink or enjoying a cocktail. Located in the heart of a UNESCO heritage site, The Norman hotel features one of the trendiest cocktail bars in Tel Aviv. 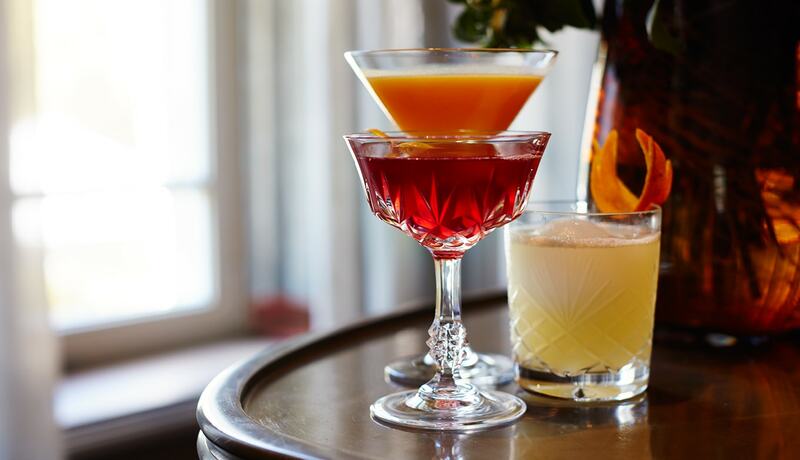 The Library Bar at The Norman is led by Noy Davidai and a team of expert mixologists, who are excited to share their profound skills and flavors with you. This Tel Aviv cocktail bar serves a unique “The Norman Signatures” and “The Norman Classics” menus, as well as a wide selection of champagne, white, red or rose wines. For happy hour, the selection of beers, unique mixes of gin, and the exquisite rum flavors are recommended. If you are more daring, or simply need a stronger drink, you can try one of the tequila, mazcal or vodka options. The elaborate whiskey menu features top picks such as highland park 18, Glendfiddich 21, The Macallan 21 or the Chivas Royal Salute 38. The Library Bar’s menu also features a selection of aperitifs, digestifs and grappa, as well as fine cognac, Armagnac and calvados. This cocktail bar in Tel Aviv actually serves the Hennessy Richard Per and the Remy Martin Louis XIII Per 20ml for special occasions. For important business ventures or contract signings, The Library Bar offers a high-end cigar menu, including the Montecristo Open Eagle and the Romeo Y Julieta Wide Churchill. For a unique and historic experience, try one of the white wines of Israel. These include wines from the Golan Heights, the Upper Galilee, the Carmel Range, the Judean Hills and the Negev areas. The selection of French wines, from marvelous locations such as Burgundy, Alsace, Jura, Loire Valley, Rhone Valley and the South of France are perfect for a romantic night out with a taste of more. The white wines originating from Italy are known for their charm and grace. The Library Bar serves wines from North East Italy, North West Italy, Central Italy and Siciliy. In addition, wines from Spain, Germany, Austria and Slovenia are highly recommended, as well as the Santorini Thalassitis Unoaked from our neighbor-Greece. The Rose menu includes wines from Italy and France, and the Red Wine menu is a delight in itself. Featuring Israeli wines from the Golan Heights, the Carmel Range, the Judean Hills and the Negev, alongside French wines from Burgundy, Jura, Loire Valley, Bordeaux, Sud-Ouest, Rhone Valley, Languedoc and Roussillon creates an invigorating sensory experience at the bar. The famous Italian red wines, from North East, North West and Central Italy, as well as from Sicily, and the unique Spanish wine menu, are sure to create a memorable experience from your stay in Tel Aviv.